and it is the third largest parliament building in the world. It is situated on the banks of the River Danube and totally dominates any view of the water! It is still a working parliament but tours are offered… but with around 20 kilometres of stairs I decided that was too much walking so we viewed it from outside! A closer look at traditional Hungarian goulash… I might try making a meat free version soon! Street food is a deep fried bread called ‘Langos’ (lang-gosh) usually topped with sour cream and cheese… but salad can also be found to contrast with the oily base or if you’ve a sweet tooth, try it with nutella! Crispy fried bread type dough called langos are sold from street vendors all over the country! Nutella topped langos for those craving something sweet! (none for me)! Hungarian langos topped with salad and cheese (no not mine but I did pinch some cucumber)! Vegetarians and vegans are also catered for if you look hard! Oh no… look what the bus drove past before we had time to get off! A selection of whole fruit juices… not to be confused with the brightly coloured syrups on offer stating 100% fruit!!! I found a meat free restaurant selling this coconut ice-cream – free from dairy, gluten and sugar! So yummy but I think half an hour at room temperature would have helped! Rock solid ice-cream! It was very yummy even if we did have to ask for a mug of hot water to defrost it in a bit! Several places also sell falafel so if nothing else at least there is something! If all else fails, most kebab shops (gyros) sell falafel and are happy to serve without the bread and sauce. Staying in a spa hotel we were fortunate to have a very wide choice for breakfast… they even had fresh cherries one day! yumyum! Hot food, cold food, dairy free milk choices, salads, fruits, as well as yogurts, breads and pastries. I was so happy to find plain oats as part of the cereal selection and seeds and raisins too! Astounded I was! Not just soya milk, but rice and oat milk too! :)Thumbs up to our hotel! Delicious fresh sweet cherries for breakfast! Canned fruits were also on offer if you like the added sweetness. Not sure on this one and I didn’t try any, but salads (and curd cheese variants) were available for breakfast! 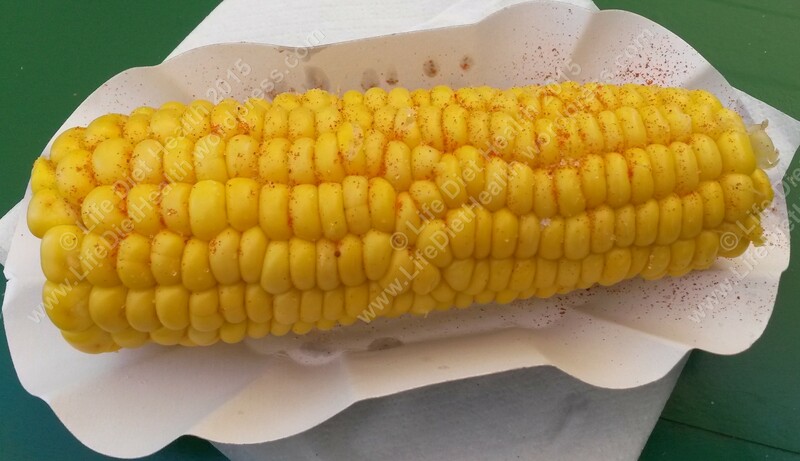 Corn-on-the-cob or sweetcorn (kukorica) is another popular street food and although I’ve never thought of it before, sprinkled with paprika – the traditional Hungarian spice (of which there are FORTY varieties) makes it even more delicious! Yumyum! Probably the easiest purely vegan food you will find in Budapest! Looks like you had a great time in Budapest! Great city, isn’t it. Nice to be able to relax a bit during your hectic days!